Book (closed) displayed with box. Pop-up page spread #1 . Tri-fold page spread with origami section closed. Tri-fold page spread close-up with origami section partially opened. Letterpress printed from photopolymer plates and woodblock, with laser cut elements throughout. My approach to artists’ books combines personal narratives with book forms that present the reader/viewer with intimate reading experiences as well as intricate three-dimensional objects that can be displayed as sculpture. The idea of giving order to personal experience through the use of mapping, charting, and numbering continues to be an important underlying theme that runs through much of my work. Enclosures such as boxes, along with the corresponding concept of creating a world within a world, also play a major role in the presentation of my bookworks. I use the crafts of letterpress printing and hand bookbinding, combined with more modern technologies such as photopolymer plates and laser cutting, to create work that is designed digitally but produced with an intense attention to the materiality of the resulting piece. For me, the physical object itself is of equal importance to the visual and textual ideas expressed within the pages in conveying meaning and presenting the reader/viewer with a compelling experience. This experience begins with the reader’s/viewer’s initial perception of the container for a piece, and then continues on through both the eye, through the process of reading/viewing, and the hand, through the manipulation of the piece’s structure and materials. Over the last twenty or so years of working in the field, I have become increasingly interested in exploring the time-based aspects inherent in the book form. The fact that the full content of a piece can only be revealed over time with the turning of the page, or an equivalent action, on the part of the reader/viewer, is an enduring fascination for me, and is, I believe, one of the book form’s most singular features. 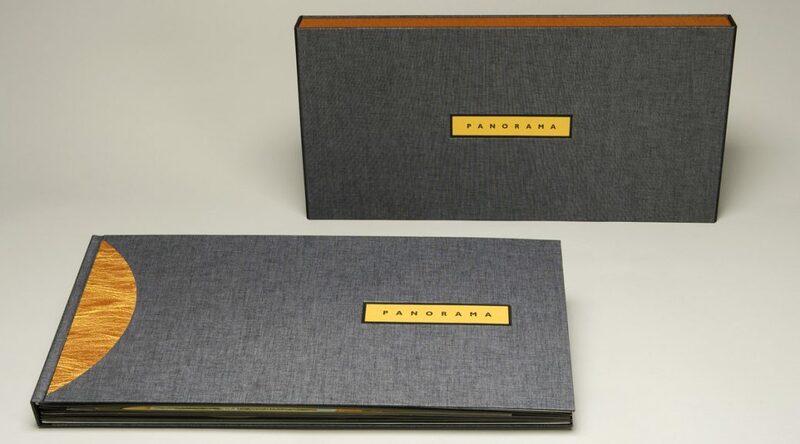 Panorama is composed of a title page, colophon page, and three large tri-fold page spreads with origami-folded central sections that alternate with two page spreads that contain large four-tiered pop-ups. It includes photographic imagery, and shaped pages throughout. All visual elements have been letterpress printed from photopolymer plates and wood blocks. 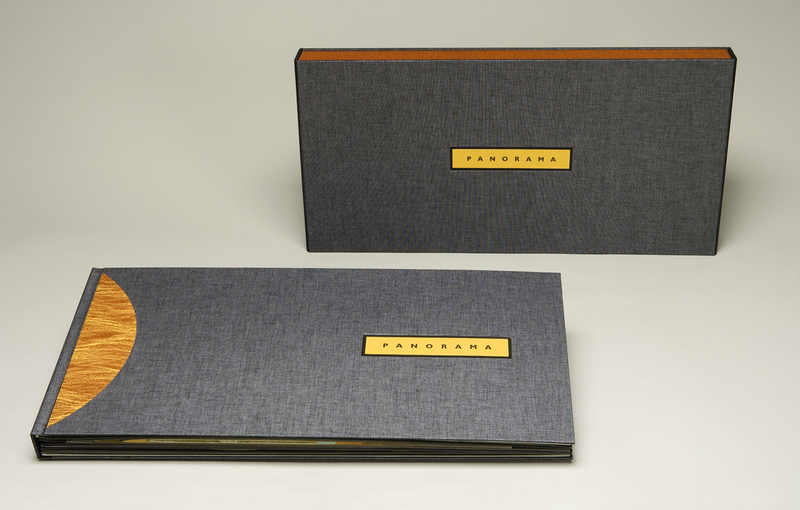 Panorama is one of the most ambitious projects I have ever undertaken. It presented technical challenges in regard to size and physical format as well as design challenges in regard to the presentation of the intended content to the reader/viewer. The book presents thoughts and ideas about climate change, which I experience personally as an overwhelming and frightening topic, but one that I recognize to be of the utmost importance at the present moment. 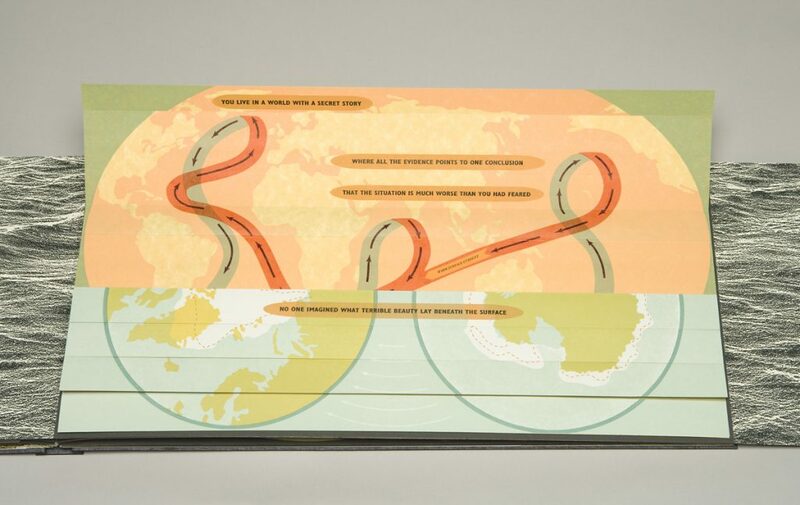 My goal was to give the reader/viewer an experience that allowed for difficult information to be delivered at the readers own pace through the use of origami folded sections, and to put the reader in an environmental context through the use of wide fold-out sections that surround the reader/viewer in a visual landscape as they manipulate the folds that reveal the text. These intense reading experiences are alternated with intervals of surprising beauty and majesty that are presented in the form of large pop-ups that present visual representations of our environment at two vastly different scales. My hope is that the reader/viewer will come away from the experience of reading/viewing the book with equal measures of concern for the present state of the environment and wonder at the intricacy and splendor of the world around us.